The final lot of the sale, a Swiss Spirit colt costing £110,000 topped a buoyant Tattersalls Ascot Breeze Up Sale where there was an increase in trade which produced a clearance rate of 86%. The aggregate of the sale concluded at £1,377,000, the median at £13,000 and the average of £20,552. Last but not least was certainly the case at today's sale. The final lot of the day, Lot 91 topped the sale selling to Jamie Osborne for £110,000. The Swiss Spirit colt, who oozed presence and class, was consigned by Knockanglass Stables. Osborne, standing with assistant Katie Moffatt, saw off competition from the Cool Silk Partnership and Matt Coleman of Stroud Coleman Bloodstock for the colt. Lot 58 produced a lucrative pinhooking success for Robson Aguair. 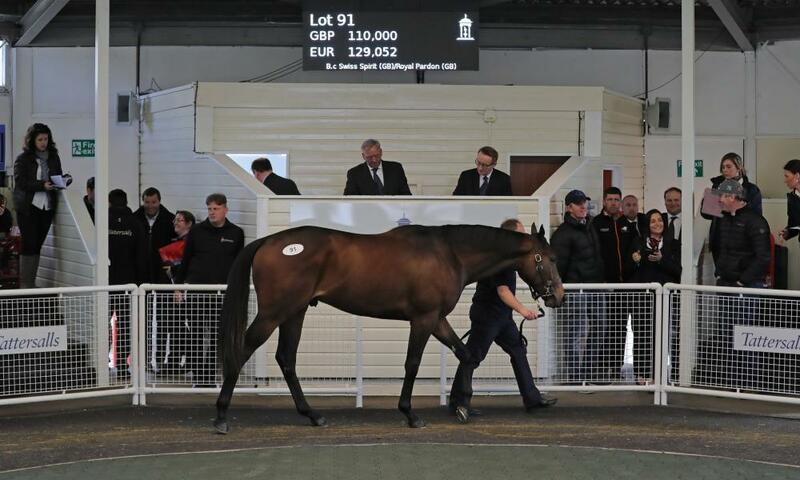 Aguair purchased the Coach House colt at the fledgling Ascot Yearling Sale in September for just £2,000. Fast forward eight months and the colt, closely related to Hellvelyn is knocked down for £85,000 to Stroud Coleman Bloodstock and the Cool Silk Partnership who have experienced such success with their Ascot Breeze Up graduate Sands Of Mali. Lot 51, the US bred Summer Front colt out of Iboughtheranyway consigned by Brown Island Stables realised £85,000 to Blandford Bloodstock and trainer Richard Hughes. Earlier in day, Jamie Osborne secured Lot 28, a grey colt by the Yeomanstown resident Gutaifan from Meadowview Stables for £60,000. The March born colt out of the two-time winning mare Burning Dawn, is from the family of US black-type performers Ski Holiday and Boxwood. Lot 84 also shared the second highest price of £60,000. Dusany Stables, consignor of 2018's top lot, sell the Hot Streak filly to the Cool Silk Partnership and Stroud Coleman Bloodstock. The filly is out of Qatar Princess who is a half-sister to the consistent Group performer Hawksmoor. "Achieving a healthy clearance rate was our foremost priority entering this year's Tattersalls Ascot Breeze Up Sale. An increase in the clearance rate to 86% was achieved following a notable effort from the entire team since last year's sale. The £100,000 Royal Ascot Bonus caught the imagination of both vendors and purchasers and a reduced catalogue ensured vibrant trade from start to finish. Tattersalls Ascot Breeze Up Sale has celebrated some notable graduates over the years including Gr.1 winners The Wow Signal and Sands of Mali and is an established date in the Breeze Up calendar. Whilst top lots often grab headlines, it was extremely gratifying to see Robson Aguair pinhook his son of Coach House from £2,000 from our own Ascot Yearling Sale in September to realise £85,000 here today. "We would like to thank Ascot Racecourse for producing an ideal breezing track yesterday and GBRI who have assisted us greatly in attracting overseas clients."